Flexite Labs Have A Choice of Many Different Thermoplastics for Partials and Dentures! Flexite Plus and Flexite Supreme are nylon thermoplastics ideal for removable partials. Flexite Plus is the most flexible and unbreakable. Flexite Supreme-N is more cast like for precision fits. Our Flexite Supreme-N is available in crystal clear formula for beautiful TMJ, Bruxism, Sleep Apnea Devices and Framework. Flexite Supreme Crystal Clear is the highest flexural strength, allergy free, clear medical grade nylon thermoplastic in our dental industry. Flexite Supreme-N is also available in light pink, dark pink, and ethnic brown for fabricating accurate fitting partials and full dentures. Flexite Supreme-N is easy to trim and polish and has a super high luster. It is a great all around thermoplastic for removable prosthetics. Flexite Ultra is a nylon thermoplastic used exclusively for full dentures when a patient is allergic to acrylic. Flexite Ultra is allergy free and unbreakable when used for full dentures only. Ultra is very accurate fitting. No shrinkage. Flexite Ultra will reproduce the pallet just like standard acrylic dentures. Flexite Ultra is 100 times stronger than conventional acrylic. Flexite T-VAL is similar to Myerson Duraflex and TCS I-Flex however Flexite T-VAL is available with or without cosmetic veins. Our competitors do not give you this choice with their polyolefin thermoplastic for partials. T-Val is available in light pink, pink, dark pink, natural and ethnic colors. (With or Without Veins). T-VAL is lighter than nylons and floats in water. Therefore it stays cleaner and odor free longer than nylon thermoplastics. T-VAL does not absorb water and is not damaged in boil out when adding to an original case. Flexite M.P. is a multipolymer acrylic for full mouth restorations, bruxism, TMJs and anti-snoring devices. Ideal for when a patient is not allergic to acrylic because it is easy to reline in the dentist office. Flexite M.P. is already polymerized so no liquid monomer is added during manufacturing. This makes it kinder to mucosa than conventional acrylics. Flexite MP is a crystal clear acrylic. Allergy prone patients can use our crystal clear Flexite Supreme-N thermoplastic and our Ultra clear nylon for bruxism, TMJs and anti-snoring devices instead of our Flexite MP acrylic. Flexite Supreme-N and Flexite Ultra are allergy free medical grade thermoplastics than do not contain acrylic or monomers. Our Flexite Acetal is available in most Vita and New Hue Shades. Flexite Acetal is newly formulated to accurately match the Vita shade guide. Flexite just added three new bleach color Vita shades: OM1, OM2, and OM3. Flexite Acetal is used for tooth colored frames and clasps, provisional splints and clip on cosmetic veneers. Our Flexite bulk Acetal is priced over $100 less per kilogram than our competitors. 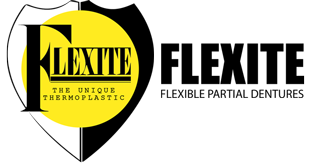 Why pay more for an inferior product when you can have Flexite Acetal Quality and a Great Price Too! Flexite has cartridges to fit most brand injection machines. (21.7mm, 25mm and 28mm) Flexite Cartridges come in lengths: small, medium, large and extra large. – First to develop patented prefab clasps. – First to develop technique to add and reline flexible partials without re-investing in flasks. – First to introduce tooth colored clasps to the dental industry. – First to introduce adjustable bruxism or TMJs with Flexite M.P. – First to offer free shade guides for our Flexite Laboratories.